Bing is one of the most underestimated search engines in CIS countries. Advertisers choose Google Ads, and potential customers just pass by. Interested in the west market? Insufficient Google Ads traffic? Want to have more conversions? Google Ads and Bing share one concept — contextual advertising tools which allow advertisers to find their target audience, to get qualitative traffic and conversions. At the same time, each platform has its own peculiarities and advantages. Some of them I will describe in this article. Search Network. It includes Search results pages and other Google resources («Maps», «Shopping», etc.). Partner search sites are available here as well. Display Network. It includes Google sites like YouTube, Blogger, Gmail and a lot of partner resources on the internet. Bing by Microsoft consists of three search engines — Bing, Yahoo!, AOL — and their partner sites. So advertising set up in Bing may be shown in three search engines at once and on partner sites. There are three key factors which affect search engine efficiency for business: market share, efficient subjects and users. On a worldwide scale, Google’s market share exceeds 91%. Bing (and Yahoo as a partner) got 5,32 %. The situation is quite different in the US. According to the last report of comScore for September 2017, you lose 34% of PC and laptop users if you don’t use Bing. Totally, Bing provides access to 63 mln users who don’t use Google. Wordstream calculated key performance indicators of various subjects in Google Ads and Bing. 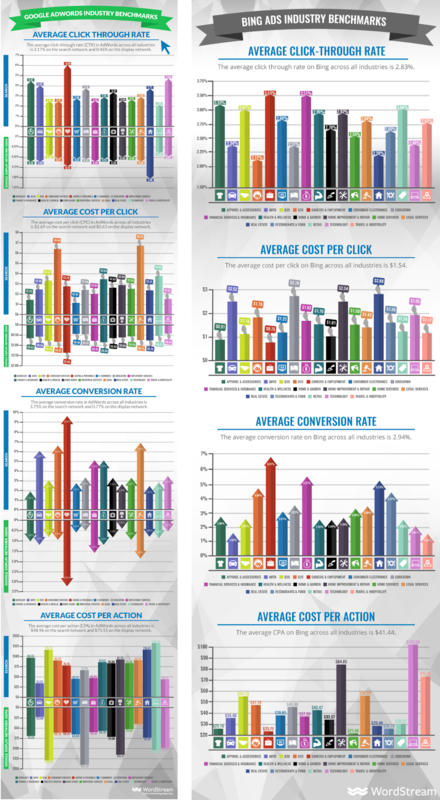 Diagrams provide data on average CTR, cost per click, conversion rate and average cost per action (conversion). Comparison of average indicators in Google Ads and Bing for a definite area allows you to understand what search engine is more efficient for your business: Google Ads or Bing. E.g. average conversion rate for real estate is 5,13% in Bing and 2,47% in Google Ads. And conversion cost in Bing is four times lower — $29,4 vs $116,61. Bing official site offers to choose a business area and view what users may be driven. 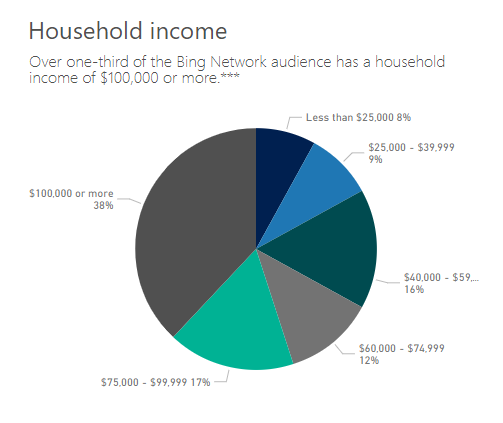 54% of Bing users are over the age of 45, 43% are married and earn more than $100 000 a year per one family. Google users are younger and more progressive. The interface design of Bing Ads resembles an old version of Google Ads — the same structure and navigation. The main difference and advantage of Bing is the functionality of importing campaigns from Google Ads. You may transfer already set up account and launch an advertising campaign in Bing just in two clicks. Ads in Bing and Google Ads have much in common. But still, there are two differences. 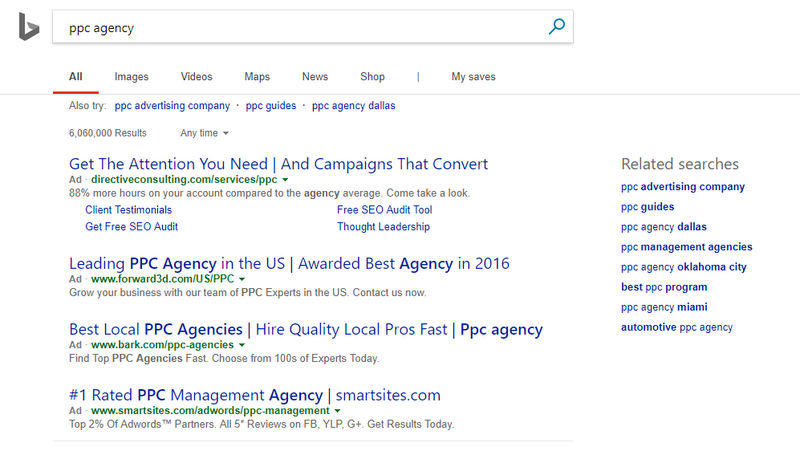 First: Bing highlights site domain and search query in ad text (especially in headers) in bold. 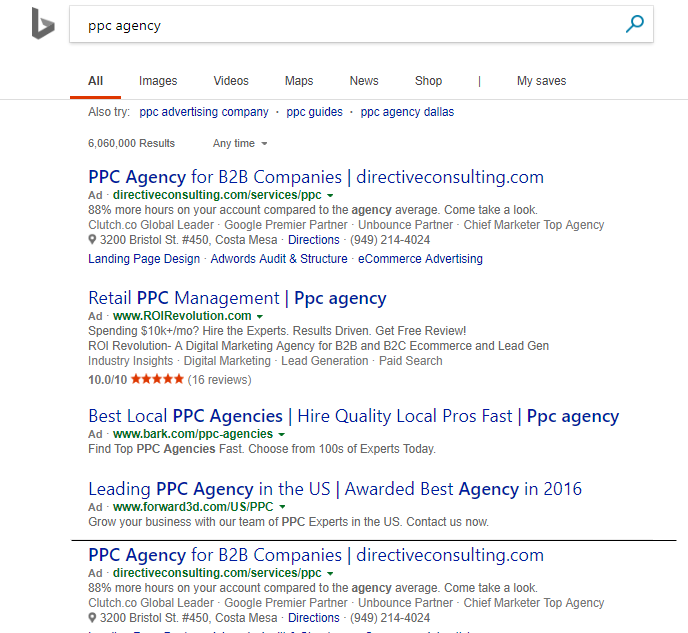 Second: Bing may show one ad twice — at the top and bottom of the search results page. E.g. What makes Google Ads better than Bing Ads? Google Ads provides scripts for routine tasks automation, advanced smart editor, integration with Google Analytics. Bing considers opinions of its users and continually holds votes for new ideas. Google Ads has already worked its way up. Google Display Network covers 2 mln sites and more than 90% of internet users. Ads are shown on sites, in videos and mobile apps. Display Network is a huge field of opportunities. It helps not only tell the potential clients about your business but reach those who haven’t made a purchase yet using remarketing. Bing Content Network ceased to exist in July 2017. Google is a search engine number 1 since 2003. It’s bigger and more popular than Bing. The more the traffic is, the more conversion may be received. Google Ads works in all countries of the world except sanctioned regions (Crimea, Cuba, Iran, North Korea, Sudan, Syria). Bing Ads is available only in 35 countries. Truth be told, Bing is ready to develop, therefore, there is a possibility to suggest a region for targeting or vote for a region suggested before. Google Ads allows targeting on 46 languages, Bing — just on 12. Aside from that, ad language defines a country for targeting in Bing — ad will be shown only if you properly choose a language for a definite country. E.g. in Germany, ads may be shown in German and English. If you choose Italian or French, ads won’t be shown. Google Ads, besides a possibility to set bids manually, provides seven automated bidding strategies and smart bidding based on machine learning. Bing Ads suggest manual bidding or enhanced CPC. They’re testing three more strategies: Maximize Clicks, Maximize Conversions, Target CPA. Create a new account with another currency. Edit a bid at the level of devices or location. If to decrease it by 40% — bid will be 0,03, by 80% — 0,01. Competitiveness in Bing is weaker, therefore, traffic is cheaper. Low cost per click is especially interesting in highly competitive niches — jurisprudence, insurance, medicine. According to ReportGarden, the average cost per click in Bing is 60% lower than in Google Ads. 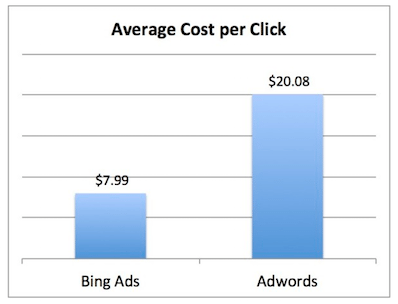 In fact, the average cost per click in Bing can be up to 70% lower than in Google Ads. Search Engine People found that the cost per click in the automotive industry was 32.5% lower and in insurance — 59.2% lower in Bing. 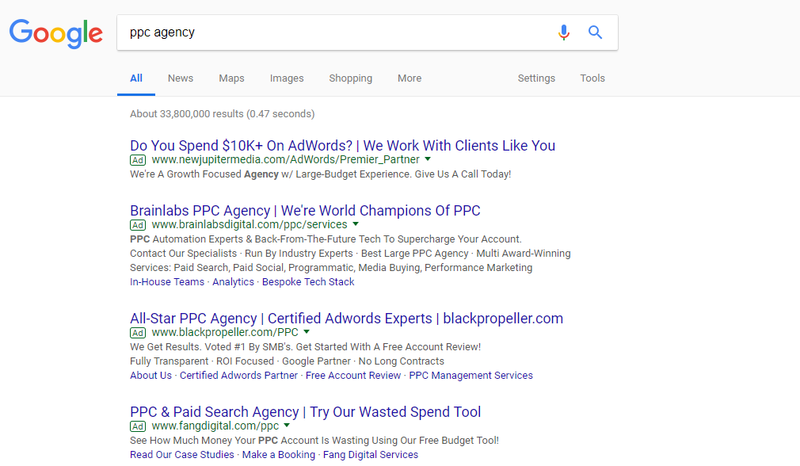 Google offers advertisers only two options: to target the search network or to show ads on the search network and on sites of search partners. There is no alternative. — in all search networks at once. You can also create a report and view which search partners drive traffic to the site, and which ones should be excluded. In Google Advertising, the time of day is based only on the time zone that is selected when creating the account. For different countries, you have to manually calculate hours and set the schedule. It's different in Bing Ads. Ads are shown based on the user's location. That is, no additional settings are required — Bing will do everything itself. Manage advertising campaign in the US? Connect to Bing. The target audience is over 45? Connect to Bing. Want to pay up to 70% less than in Google Ads per click? Connect to Bing. Have a small budget? Connect to Bing. Want more orders? Connect to Bing. Don’t know what to do? Connect to Bing. I work as a PPC specialist at Tonti Laguna. I am Bing Accredited and Google Certified. We're happy we could help you! What do you mean? Could you please explain?